Quad-leg Raised Stand for easy fill and empty of the drum. Large Construction site sized solid rubber tyre wheels for easy movement and allow wheel barrow style movement of your mixed slurry. Machine can operate either on the stand or at ground level. Fully rotational 360 degrees for accurate barrow filling and empty on site. Large removable Rubber wheels for easy on site movement. 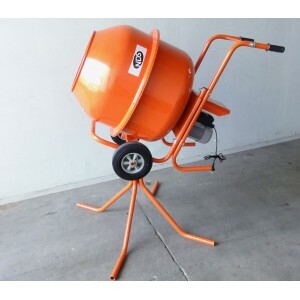 This is a serious piece of gear for contractor as well as home use. This machine is supplied as a self assembly kit. We do offer an a fully assembled version at a small premium, but the Fully Assembled unit is for Pick Up Only... It will not freight easily on a pallet. The carton is large and quite heavy, weight and measurements are included in the photo's. A 12 Month RTB warranty covering manufacturers fault applies. Fair Wear and Tear and Exposure damage is excluded.